Mackerel is a good source of long-chain omega-3, and it's given a tasty boost by the walnut oil. Brown rice is vitamin B-rich, so the dish packs quite a nutritional punch. Cook the brown rice in salted water until tender – for 25 minutes or according to the packet instructions – then drain. Meanwhile, heat the olive oil in a large frying pan and sauté the mushrooms for 3 minutes until they begin to soften. Add most of the onion, saving a small handful for decoration, and cook for a further 2–3 minutes until soft. 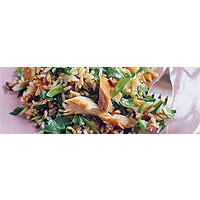 Tip in the cooked rice, add the smoked mackerel and heat through for a few minutes, stirring so it heats evenly. Just before serving, stir in the coriander and drizzle with the walnut oil. Top with the remaining salad onions and some black pepper before serving.